In the wake of the upcoming presidential polls, Communist Party of India (Marxist) Secretary General Sitaram Yechury has assured that the opposition will mount a fight against the Bharatiya Janata Party (BJP) and the Rashtriya Swayamsevak Sangh (RSS) in defence of the minorities of the country. "This is a political fight. 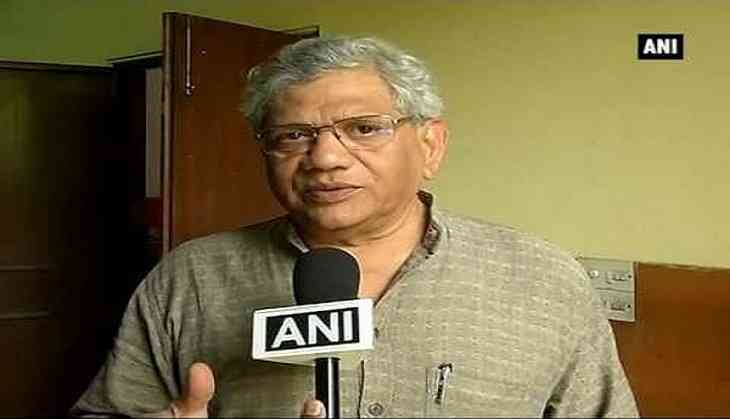 It is between those forces who want to strengthen the values enshrined in the Indian constitution and it's against those who are undermining those values which is represented by the BJP and RSS", Yechury told ANI. Yechury made specific appeals to Janata Dal United (JDU) leader Nitish Kumar and Orissa chief minister Naveen Patnaik to rethink their stance in the matter..
"We have appealed all the political parties, especially JD(U) and Orissa's Naveen Patnaik. We have also spoken to Arvind Kejriwal of Aam Aadmi Party", added Yechuri. Yechury asserted that all the parties who cherish the Indian constitution must come together in this fight. Earlier today, nominee by the National Democratic Party (NDA) for the upcoming Presidential elections, Ramnath Kovind filed his nomination papers in the Parliament House. Prime Minister Narendra Modi accompanied Kovind to file his nomination to be the 15th President of India. Addressing media after filing his nomination papers for the July 17 elections, Kovind said, "Ever since I took over as Governor, I have no political affiliation. President of India is above politics," Kovind said. Kovind resigned from the post of Bihar Governor after he was selected by the Modi Government as its candidate for the country's top post. Kovind's candidature has been opposed by many Opposition parties over his affiliation with the ruling Bharatiya Janata Party (BJP). He represented the party and Uttar Pradesh in Rajya Sabha twice and was BJP spokesperson prior to his appointment as Bihar Governor in 2015. Kovind filed his nomination papers in presence of Prime Minister Narendra Modi and other senior NDA leaders. "In our country Constitution of India is supreme. We have to uphold the values enshrined in our Constitution," said the NDA's candidate who will face the Opposition candidate and former Lok Sabha Speaker Meira Kumar. He also said that he would do everything to maintain the dignity of Indian President's post. "I am thankful to all those who have supported me, will do everything to maintain the dignity of country's top post," Kovind said.